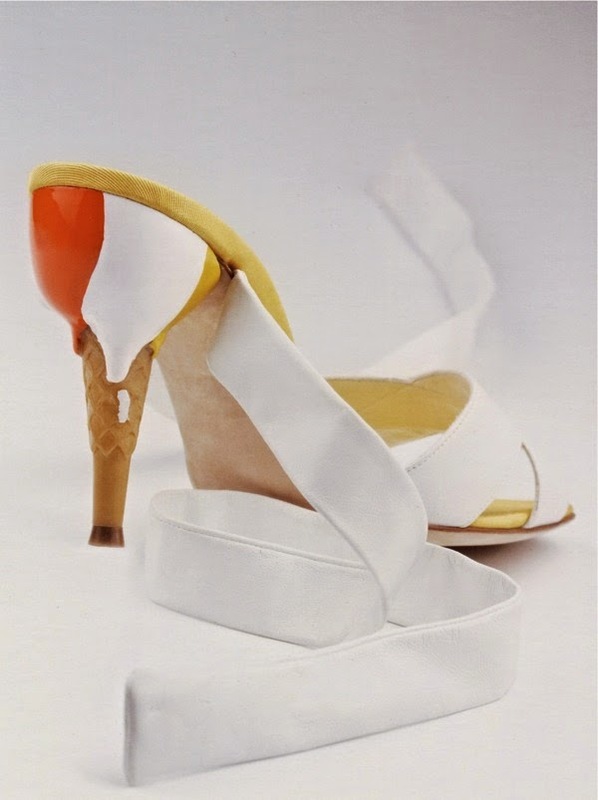 A perfect example of Pfister's elegant and witty design in the tradition of bizarre shaped heels (carrots, pineapples, diamonds). That's what passes for creativity today. After all, Lagerfeld - or whoever is designing shoes for him - is running on fumes. A quick peek at the 2015 Melissa collection reveals ideas borrowed from everywhere, especially for heels, like the stacked spheres (the last of a long series) or the Fluevog-inspired like this one here below. Inutile sorprendersi: un plagio, anche se così evidente non rappresenta una novità nel mondo della moda. Sconcerta invece che un'intera mostra dedicata al rapporto tra cibo e moda non vada oltre la superficie. Accade con "L'eleganza del cibo. Tales about food and fashion", a Roma sino al 1° novembre 2015, ai Mercati di Traiano. 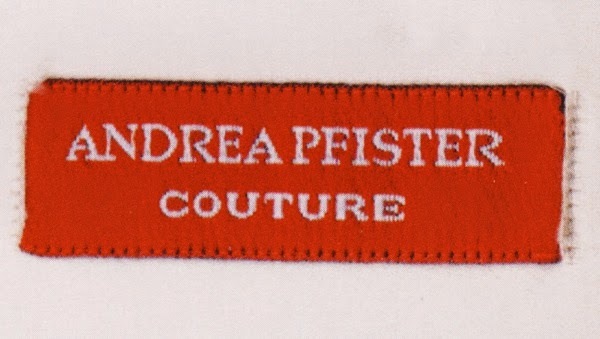 Per quanto riguarda le calzature, nessuna traccia di Andrea Pfister, ma si compensa con il cono di Lagerfeld, le scarpe realizzate con pelle di dentice (Ferragamo - fuori tema) e la clonazione di Albanese della scarpa pesce di André Perugia (fuori luogo). Con il patrocinio di MIBACT, EXPO; promossa da Assessorato alla Cultura e Turismo di Roma e Sovrintendenza Capitolina ai Beni Culturali. Plagiarism, although so obvious, is nothing new in the fashion world. 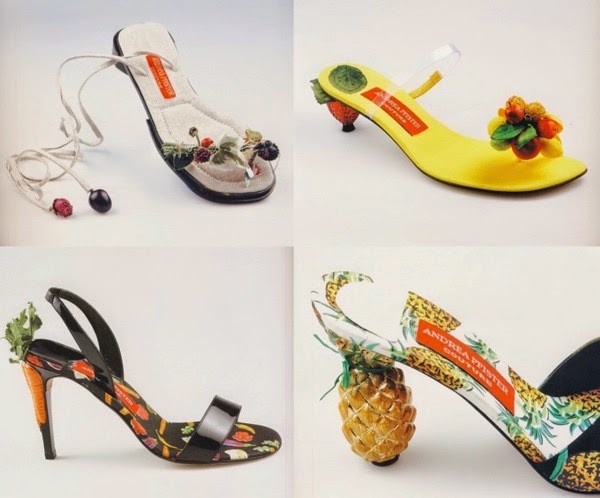 However, it is baffling when an entire exhibition devoted to the relationship between food and fashion doesn't scratch the surface. It happens with "L'eleganza del cibo (The elegance of food). 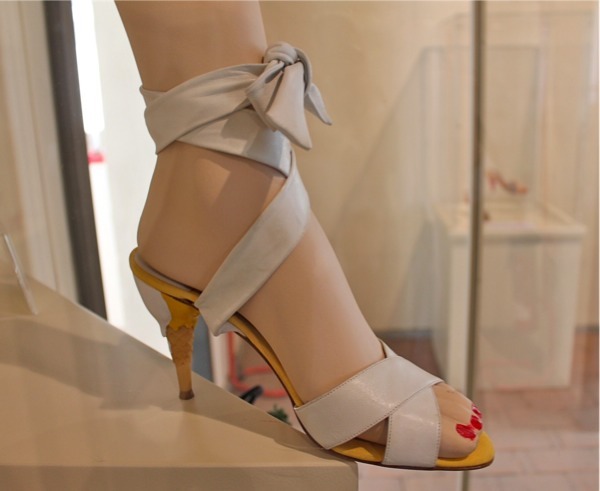 Tales about food and fashion" on display in Rome until 1 November 2015 at the Marcati di Traiano. 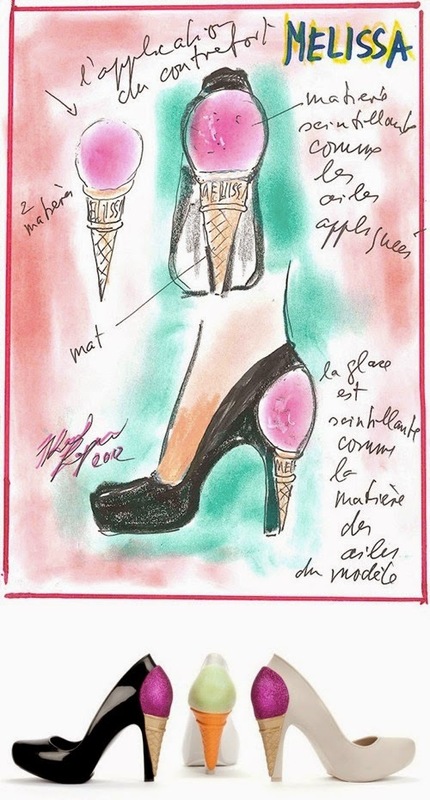 Footwear wise, no trace of Pfister, but you'll find Lagerfeld's ice cream, shoes made with snapper skin (Ferragamo - off topic) and the Albanese replica of the André Perugia fish shoe (out of place). Exhibition supported by MIBACT (Ministry of Cultural Heritage and Tourism), EXPO; sponsored by Department of Culture and Tourism of Rome and Rome's Superintendence of Cultural Heritage.